One of the first things people notice about you is your smile. It should dazzle people when you’re laughing, when you’re speaking, when you’re at a job interview, and when you’re meeting someone for the first time. Your smile is an incredible thing that communicates to the world what you’re feeling, and it should be a masterpiece. Mercier Dental is committed to giving you a smile that is healthy and beautiful. From routine cleanings to dental surgery, you should feel confident knowing that your smile is in the best of hands. We have the best staff, the best services, and the best clients, and we love to exceed your expectations. Our staff members are certified professionals who want you to have the smile you’ve always desired, whether that means making it a little bit straighter or performing regular cleanings and checkups. Headed by Dr. Mercier, our team of highly-trained and passionate individuals will make you feel at home in our relaxing office while giving you the attentive care you deserve. We boast the best dental hygienists and clinical assistants who love what they do and build strong relationships with our patients. Our clients are like family to us, and we are dedicated to providing an exceptional standard of care to help you achieve the smile of your dreams. Sometimes the anxiety associated with dentists can stem from the cost of the services, but we don’t want you to be worried about anything but your smile. Mercier Dental offers several financing options for the care you receive here, so you can get the services you need the day you come in and make manageable monthly payments after your visit. If you have dental insurance, then we can help there, too. Most insurance plans are accepted. For your convenience and to show our appreciation for you, we will file and process the claim with your insurance company, meaning all you will have to worry about is your co-pay at the time of the visit. We’re a proud in-network provider for both CHIPS and Delta Dental, two of the largest dental insurance providers in the country. 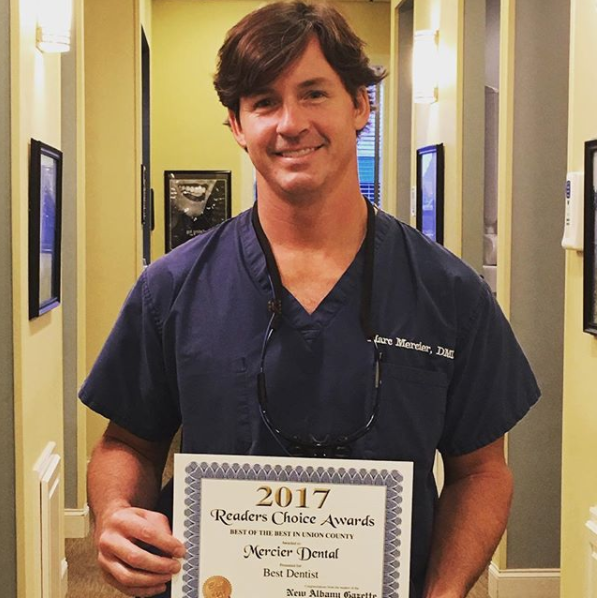 We were honored to be chosen Best Dentist. It’s an honor and a pleasure to care for you, and I promise to always give you my best with your oral health care needs. © 2019 Mercier Dental. All Rights Reserved.